Sometimes you’re just in the right place at the right time with a camera and a frame of film left. Most of my hikes along the Sonoma Coast were day long affairs and by the time I returned to the trailhead, my roll had usually been shot up. There’s never much to photograph at most trailheads anyway; parking lot, port-a-potties, trash cans and cars. On this Sunday however, I had one or two frames of Kodak Portra 400 left in my Pentax Spotmatic SP. I also had one of the most pedestrian of all Super Takumars mounted out front; the 55mm f/2. As I approached the parking lot, I saw a young couple standing close to each other on a bluff overlooking the Pacific. There was another person nearby, a woman with cameras. It appeared that she was preparing to take some photos of the couple. Maybe engagement or pre-wedding or something. I could never be a good street photographer because I have such a hard time invading anyone’s space, no matter how far away I am, but they seemed oblivious to me. 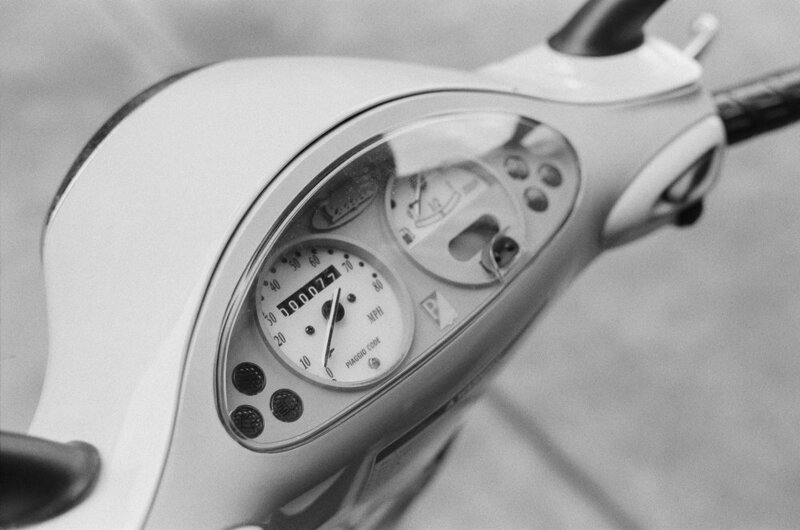 It would have been better to have a faster camera…the Spotmatic requires stop down metering…or autofocus. But everything came together yielding one of my favorites photos taken along the coast, lens flare and all. I loved my Pentax K2 right from the start as you can easily tell when I wrote about it here. Beautifully made, metal-bodied SLR with aperture priority automation. It was also the first Pentax with a vertically running metal focal plane shutter which just sounds sublime. For a short while, the K2 sat atop the Pentax line. Most every old film camera has one thing that you wish you change. Some things you can’t, like the fumbly ASA setting ring around the K2’s lens mount. Not sure why Pentax did that. It wasn’t a feature that carried on to any other Pentax camera that I know of. Perhaps they knew they made a mistake and never did it again. I am usually pretty good at figuring out how to use cameras without having to look in the online instruction manuals, but darn if I couldn’t figure out how to adjust the thing. Turns out there is an obscure little button around the bottom side of the ASA ring that must be pushed just the right way to allow it to turn. It’s not very user friendly, but since I don’t have to adjust it much, it is not a deal breaker. What was missing from my K2 and is pretty critical for the eyes of an aging photographer, was split image focusing. Most of the K2s came with just a micro-prism focusing screen and while I could focus ok with it, having a split image screen in the K2 would make it pretty close to perfect. Focusing screens in the K2 are not user changeable…at least not by someone with hardly any repair skills like me. But I was curious to see if perhaps my go to Pentax expert Eric Hendrickson might be able to help me modify my K2. Eric responded that he had one split screen left that would fit my K2 and would be happy to change it out for me. Ten days later, my K2 is back in hand with modified split image focusing and WOW! It makes all the difference. Eric had already CLA’d this camera for me last year, but it came back with an added bonus of a thorough cleaning. Nice! Pentax K2 back from the shop! Sunday afternoon. A bit of sun. A simple camera. A lot of fun! My life is starting to fall into a routine now, leaving me a bit of time for photography. 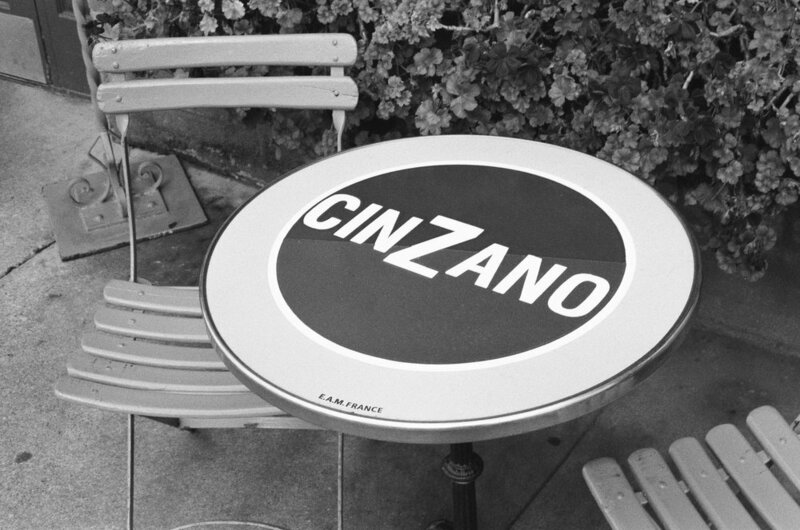 So, on a recent Sunday, I loaded up some expired Agfa APX 100 film into my Pentax Spotmatic SP fitted with one of my favorite Pentax lenses—the SMC Takumar 55mm f/1.8 and took a photo walk around Yountville, CA. I found this cool old Vespa Piaggio scooter parked outside of one of the shops. I had fun cloning myself in this mirror. I like this shot of a little market in town. I am impressed with the detail of the lamps inside the shop which are visible through the transom above the main doors. Eric Hendrickson CLA’d this Spottie and calibrated its meter. It thrills me to no end when a 55 year old camera works like the day it left the factory! There’s a nice memorial featuring some large dog tags in Veteran’s Memorial Park. When I got home, I clicked off this unremarkable shot of a lamp outside my door. It’s a simple shot, but it shows the pleasing tones this old emulsion delivers. I love Agfa APX 100 and will be sad when my last rolls of the original are gone. Taking pictures with my Spotmatic is like pulling on the most comfortable pair of jeans you own or a favorite t-shirt. It just feels good! 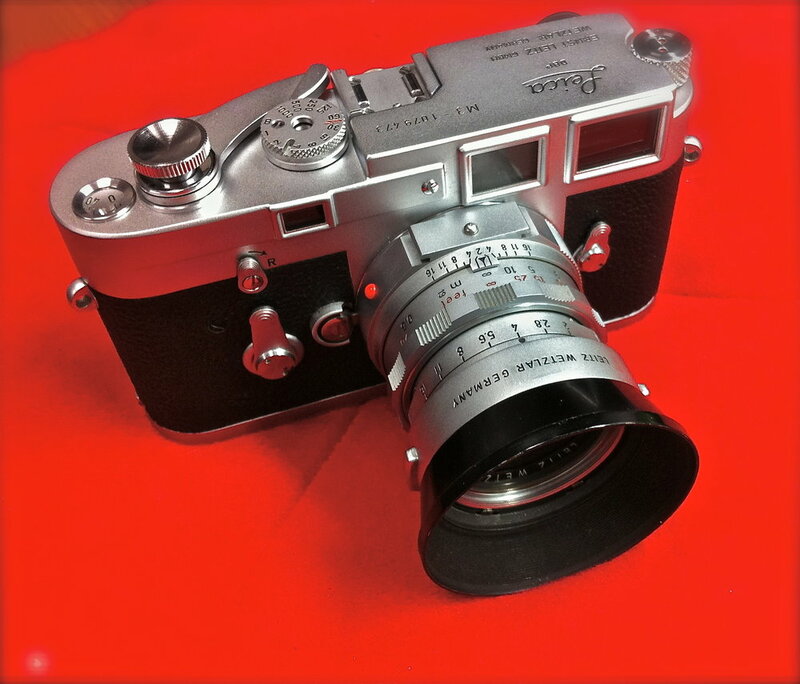 I would not have been able to afford my first Leica camera if it weren’t for Ken Hansen. A few months before, I had sold a Nikon rangefinder and finally had enough cash to put a Leica M and 50mm lens somewhat within reach. 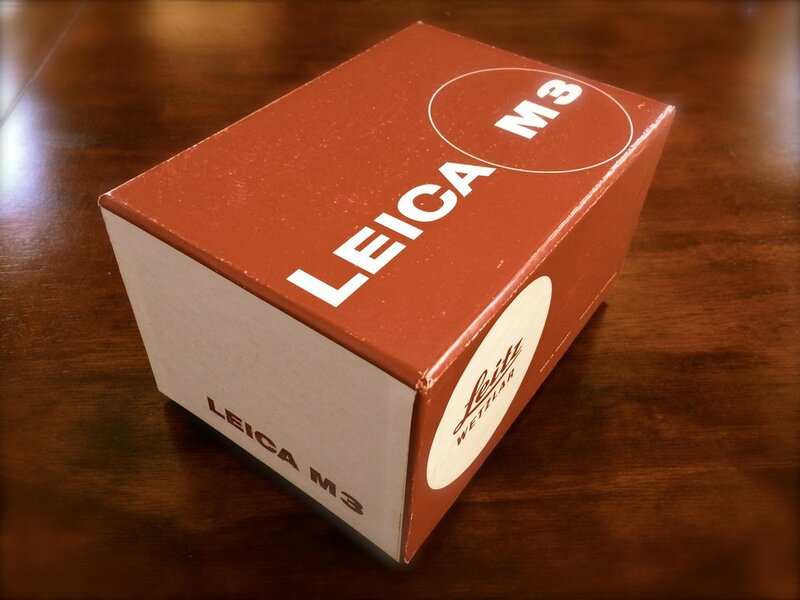 I knew of the legendary Ken Hansen through the various Leica forums and emailed to ask if he had a nice M3 around and he sent me photos of this camera and a rigid 50mm Summicron lens. Like all of Ken’s used Leicas, it was perfect and the lens was flawless. That’s the way Ken did business. Old fashioned trust. Excellent service. Fair prices. Trade ins accepted. Ken Hansen came to the US from Germany in the early 1960s. He got a job at a camera store in Manhattan right away and learned the business of the retail camera shop. In 1973, he decided to start his own place, borrowing some money from family to rent space and buy some inventory. He knew what people wanted to buy so he’d go looking for used cameras from other camera stores and private sellers, buy them and put them in his shop. Every Sunday, he’d put a small ad in the paper advertising some of his items and by Monday afternoon, they were sold. Ken told me once that his business was successful right from the start and he always felt very blessed. Ken’s business grew and he moved into larger and larger spaces. 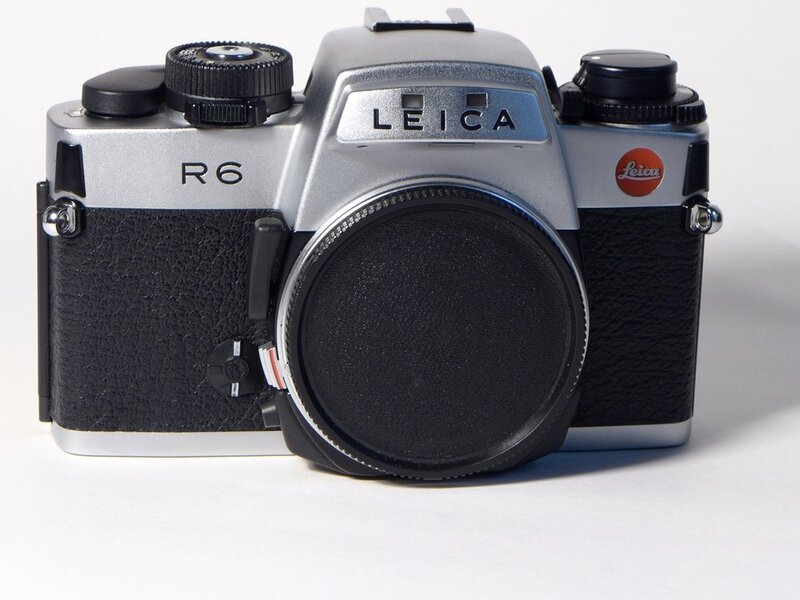 He became a Leica Authorized dealer in 1976 and was also one of the largest Rollei dealers in the US. His shop and staff grew in size. Ken told me once that when he started his business, there were a lot of dishonest people in the retail photo business. He wanted to build his business on trust, honesty and good customer service. Eventually, rents in New York City got out of control and he made the difficult decision to close the retail store and move his nearly one million dollars in inventory into his home, focusing exclusively on Leica. With no storefront and no website, Ken continued to sell new and used Leicas worldwide, operating out of his Manhattan apartment in the spring and summer months and wintering in Florida. I’ve bought almost all of my Leicas from Ken, trading in one for another. I even picked up a used Nikon or two from him, cameras he took in as trades. Each time it was the same, Ken would next day air the camera to me before I sent him any money. One time, I had a sensor issue on a Leica digital M. No worries. Ken said send it back and I will send you another, no questions asked. No one does business like that anymore. Ken had a store on eBay too, but he told me he mostly listed cameras there for something to do when he was bored. His descriptions were always well written and full of his dry sense of humor. Last fall, I emailed Ken looking for a Leica R6 or R6.2. Of course, he had a mint R6 on the shelf and sent it out next day air for a price that was far less than what comparable ones were selling for on eBay. This camera works like a charm, but I’ve just sent it in to DAG for new seals and a CLA. While he had me on the line, he also tempted me with a minty 35-70mm Vario-Elmar lens. Of course, I had to have it. I need to make time to shoot this lens soon. The R6 and this Vario-Elmar were my last purchases from Ken. I first got word something was wrong when I emailed Ken late last year asking him to keep his eyes out for a nice Leicaflex SL2. I’ve always wanted to try one of these early Leica SLRs. Ken responded that he would, but it might be a while since he had been quite sick. A month or so later, I checked in on my friend and he responded that he was still not doing well. This is Ken’s granddaughter, Summer. Unfortunately, my grandfather is too ill to continue working. We’ve received some unfortunate news from doctors that all which could be done has been. He won’t be available for business any longer as he is quickly deteriorating and struggling. Thank you for being a customer of my grandfather and supportive friend. Ken told me once that he would occasionally read my blog and that it “wasn’t half bad.” So if by chance you read this my friend, please know how much I appreciate the honorable way you’ve conducted business with me, for all your Leica advice, for giving store credit to someone you didn’t even know, for all your funny emails and your friendship. I like to pass along positive experiences I have had doing business with people in our little community of analog photographers. 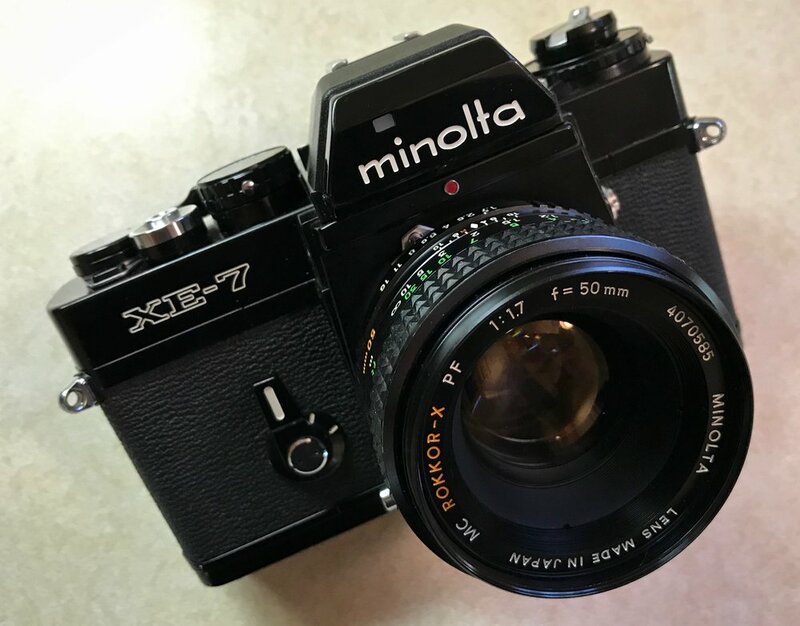 While I didn’t warm up to the Minolta SRT303 I reviewed yesterday, I do love my XE-7, the collaborative camera from Minolta and Leica. Over time, my XE-7 developed some shutter curtain lag and it’s been very difficult to find someone who still works on these cameras. One of my readers suggested I try Garry’s Camera Repair in Buffalo Grove, IL. I emailed the owner, Garry Airapetov and asked him if he worked on this model camera. He quickly emailed me back and told me he did indeed service the Minolta XE-7 and to send it in. Including USPS Priority shipping time out and back, my camera was gone about ten days. Total repairs cost less than $60. Garry was super good at communicating during the process and the repair cost included a CLA. A very positive experience. If you have a camera in need of service, give Garry’s Camera Repair a try. The school district of the little Upstate New York town I grew up in began an extensive remodel and expansion of its high school in 1972. 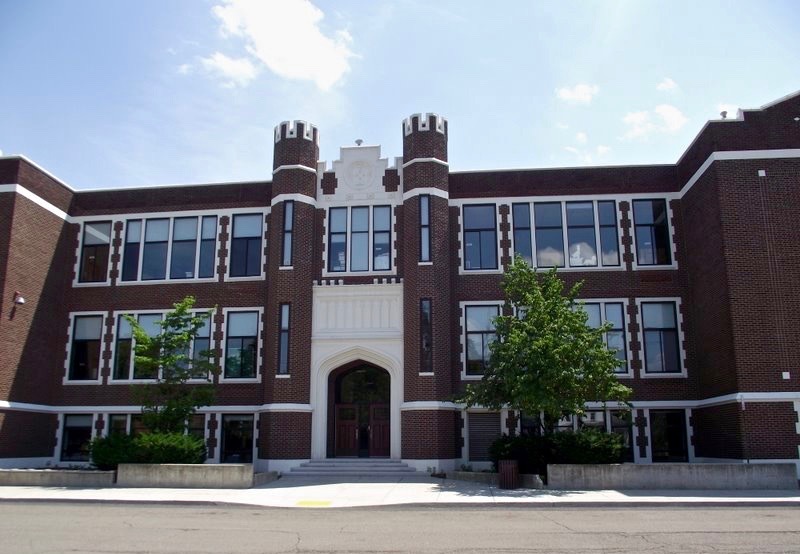 The 135,000 square feet expansion was completed by my freshman year (1974) and the remodel of the nearly 60 year old original high school building wasn’t finished until I was a junior. The expansion included more classrooms, a lecture hall, new cafeteria, laboratories and an art department complete with a then, state-of-the-art darkroom. Photography was part of the art elective and included instruction in black and white film development and printing. For students who did not own a camera, there were about a dozen brand new Minolta SRT102 cameras that could be signed out on a first come, first serve basis. 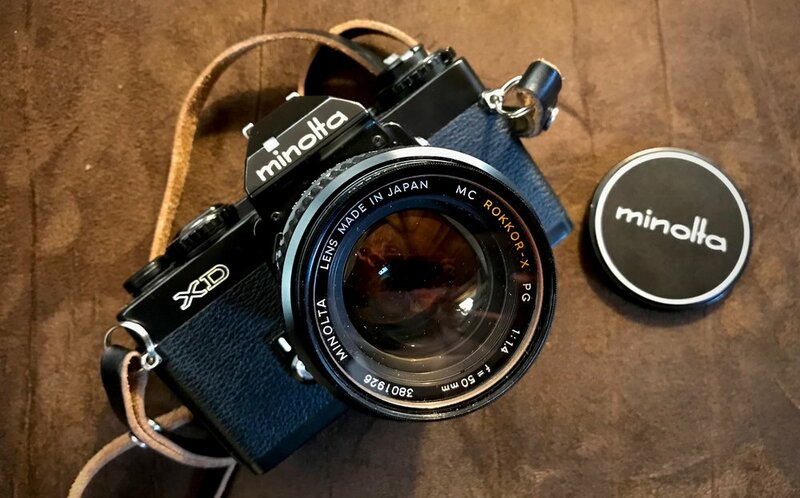 I was fortunate to have use of my father’s Kodak Retina IIc rangefinder, so I did not qualify for the camera loan program, but all of us in the class got to handle these new Minoltas and I recall being quite impressed the first time I looked through the viewfinder of a single lens reflex camera. The Minolta SRT102 was a 1973 upgrade of the classic SRT101 camera. Upgrades were minor. For the first time, both shutter speed and lens aperture were visible in the viewfinder (big stuff in 1973) and a split image focusing screen was used. The SRT line was manufactured for nearly 15 years. The SRT102 also marked the beginning of the confusing practice of Minolta assigning different names to the same model in different markets. My SRT303 was the European version of the SRT102. Because the SRT102 was the first SLR camera I had ever experienced, trying one again has been on my bucket list for some time, but never high enough up on the list for me to pull the trigger and spend some cash. Whenever I did go looking for one, most of the examples I found were pretty tired until I stumbled across this example, recently CLA’d by one of my trusted sellers. For not much cash at all, I got a nice body and a 50mm f/1.7 MC Rokkor lens. Lots of things were being manufactured out of plastic by the early 70s, but not this Minolta. It’s a big heavy hunk of metal and glass. If you have any experience with through the lens metered SLRs of this era, there are no surprises. The camera is fully manual with a match needle display in the viewfinder. Select any combination of shutter speed and aperture, center the needle in the display and you have correct exposure. Minolta called their metering system CLC for Contrast Light Compensation, a predecessor to today’s matrix metering. I’m not sure how effective CLC is as I was able to fool the meter on several occasions, but for the most part, it did its job well. My SRT303 arrived during a busy time with my move and new job, so the best I could do was shoot a roll of Fuji Industrial film around the house and yard. Unremarkable and uninspired, but any time spent with camera in hand is time spent well. I moved inside and tried some shot of various things in sunlight and shade. I tried to get a shot of the spines of some of my record albums in sunlight. Definitely blew out the highlights here. This is the first time I’ve noticed this film’s tendency to turn whites green-ish. I shot these posters in my studio with just natural backlight. The wall is pure white. You can see my reflection in the Ilford poster. My favorite shot of the roll is this one—my last remaining brick of precious Kodak Plus-X film. 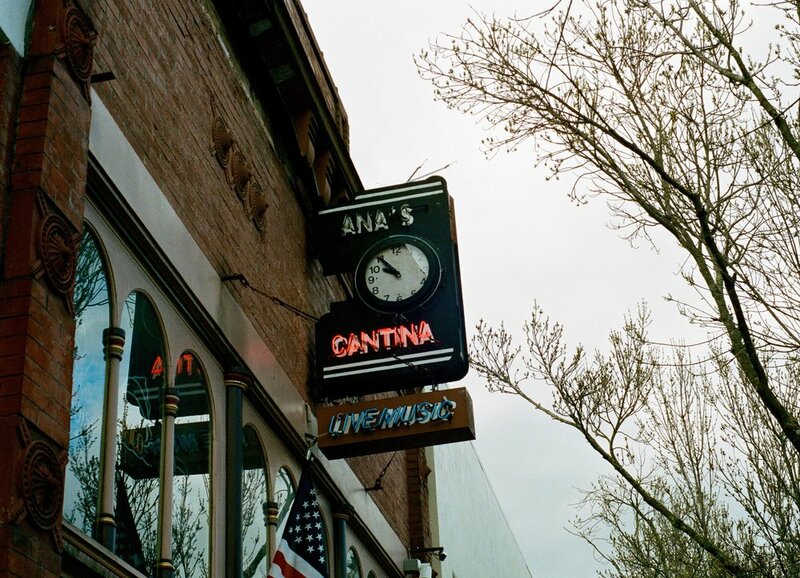 Thomas Wolfe wrote…”You Can’t Go Home Again” and so it is with the Minolta SRT303. For me, the memory of this camera is better than using it again 45 year later. Oh, it’s a capable camera that’s easy to use, but it didn't inspire me enough to pick it up again. Some things, I guess, are better left remembered. PS: Maybe this Minolta will inspire you?. It’s free to a good and loving home. Just pay shipping. E-mail me if interested. This line resonated with me as I have been thinking a lot lately about what makes me choose one camera over another as I head out for a photography walk. It would be easy for me to say that I select the camera best suited to the type of photography I am going to do that day, but the truth is that I have built up a nice stable of very fine old cameras, any of which are capable of great results when used properly. Also, almost all of my user cameras have now been professionally serviced, so I know that whichever one I select will perform as designed. Sometimes, a camera’s level of automation moves it to the front of the line as was the case with my selection of the autofocus, auto-everything Nikon F100 SLR as a travel camera when I toured the Northwest last year. I wanted auto focus, programed auto-exposure, auto film loading, motorized film advance--essentially a point and shoot film camera for that trip. The F100 was an easy choice and it did everything I asked of it. But for my more routine photo walks, I am thinking that Mike’s “tactile dimension” and a camera that “instills confidence” are really the deciding factors for me in selecting one camera over another. Right now, I am shooting an Olympus OM-1 that just came back from a CLA. There’s so much to love about these little OM wonders; small size, gigantic viewfinder, jewel-like build quality. And so light! You can carry an OM camera around all day and barely notice it. The OM-1 and the OM-2 which I also own, are both quite wonderful to use once you get used to the shutter speed adjustment which is located on the lens mount. I love the little built in handgrip on my Nikon F3. It’s just big enough to make the F3 feel very secure in your hand. And that big HP viewfinder always impresses. The F3 also has a satisfying shutter sound and pleasant film advance. Add the incredibly sharp and very affordable 50/1.8 and you have a well balanced, joyful camera that some call the greatest SLR ever. You can sure tell that Minolta and Leica were working together when the Minolta XE and XD series came out. The film advance on the XE-7 is one of the nicest I have ever used and its shutter sound is delicious! The fit and finish of the XD makes you want to hold it and use it. I love the way the shutter speed dial protrudes just a bit over the front of the XD’s body making for easy adjustments with the camera to your eye. And I haven’t met a Minolta viewfinder yet that I haven’t loved—big, bright, awesome! 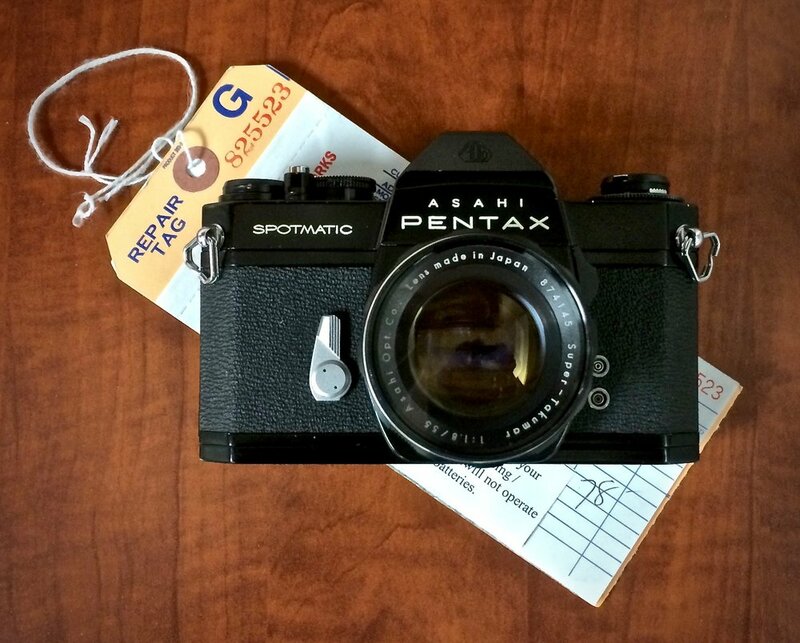 Back in the Spotmatic days, the Pentax advertising line was “Just Hold One.” There’s a lot of truth to that. Any of the Spotmatics feel just right in the hand and when you screw on one of those amazing Takumar lenses, the whole experience just goes up a few notches. Focusing a Takumar is sublime and these Taks have nice, reassuring f/stop clicks. Find an original Pentax leather case and use just the bottom portion to make the Spotmatic tactile experience even nicer! My Canon SLRs get pretty frequent workouts, mostly because they just feel so good to use. The original F-1 is substantial with a wonderful mechanical shutter sound. After a Blue Moon CLA, its meter is dead on! My F-1 New and A-1 have little built in hand grips on the front of the camera that enhance the shooting experience. And all of Canon’s FD mount lenses are quite nice, especially the early breech mount chrome nose editions. I’d rank the Nikon F4 and Contax RX at nearly the top of my list of electronic cameras that feel wonderful to hold. Both have contoured bodies with built in grips covered with a rubber material that gives the photographer a sense of security during use. The F4 has dials and levers that control everything. It’s a wonderful evolution from purely mechanical cameras to electronic technology. Many people complain about the size and weight of the Nikon F4, but if you opt for the smallest battery pack—the MB-20, the camera is very manageable. The RX compares in size to the F4 and has one of the most unique shutter sounds of any camera I have shot. And of course, it mates with a selection of fantastic Carl Zeiss lenses. Who wouldn’t love that! 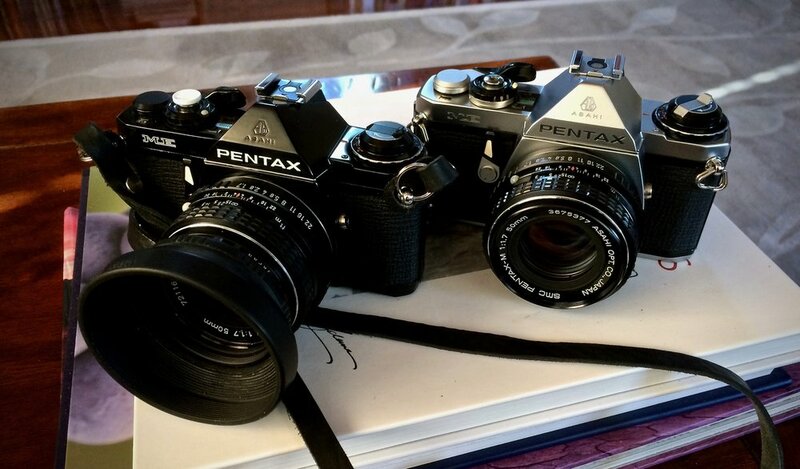 I love my little Pentax ME and MX SLRs. Simple, easy to use cameras that never let you down. These little cameras, along with the Olympus OM series, started a movement towards smaller, lighter 35mm SLR cameras. And they feel so good in your hand! With a remarkable and affordable Pentax lens up front, you just can’t go wrong. Sometimes, it’s a lens or accessory that rounds out the tactile dimension of a camera. I prefer Nikon’s old pre-Ai lenses on my Nikon F2 bodies. There’s just something about those old Nikkors. On the F2, the Nikon AR-1 soft release is a nice option. And while the Pentax LX is a super capable professional grade SLR with an awesome meter, when you add the OEM grip to the front of the camera, it becomes so much more comfortable to hold. I realize that this “tactile dimension” is mostly the reason I have not bonded with some of the cameras I have tried. My Rolleicord was a way more capable shooter than I am a photographer, but I don’t get along with twin lens reflex cameras. And the Rollei’s shutter release was in a position I just couldn’t get used to. I tried to love Hasselblad in every configuration possible. By the time I got mine loaded up with a metered eye-level finder, it was just too cumbersome to use outside of a studio environment. I didn’t love the Minolta X-700, the Rollei SL35e, Contax 139 Quartz, Canon AE-1 Program or Mamiya 1000s either. And when I think back, it wasn’t because they couldn’t make good photographs. It was the tactile dimension. I feel so fortunate that I have had a few extra dollars to spend on photography during a time when digital cameras have made analog ones affordable enough to own more than one. Thanks again to Mike Connealy for the inspiration for today’s post. Like finding a twenty dollar bill in the pocket of a pair of pants you haven’t worn in a while, I’m discovering partially shot rolls of film in some of my cameras. It’s a nice surprise. I’d honestly thought I’d processed and scanned the last few rolls from my final months shooting on the coast, but when I went to use my Olympus OM-2n last month, there were 32 shots exposed on a roll of Fuji Acros. I clicked off the last few and sent it off to Boutique Film Lab. I must have started this roll last summer, based on the fact that my subjects are lightly dressed and they lingered in the cold Pacific long enough for me to get this shot. I miss my walks on the beach and it was nice to get this roll back from the lab. December through early March was just a blur. Packing, moving, new house, new job, new everything. All the while, my photography languished. And each time I had a spare moment, the weather did not cooperate. We’ve had historic rain in Northern California. But one Sunday early in March, the planets aligned giving me both a free day and good light. 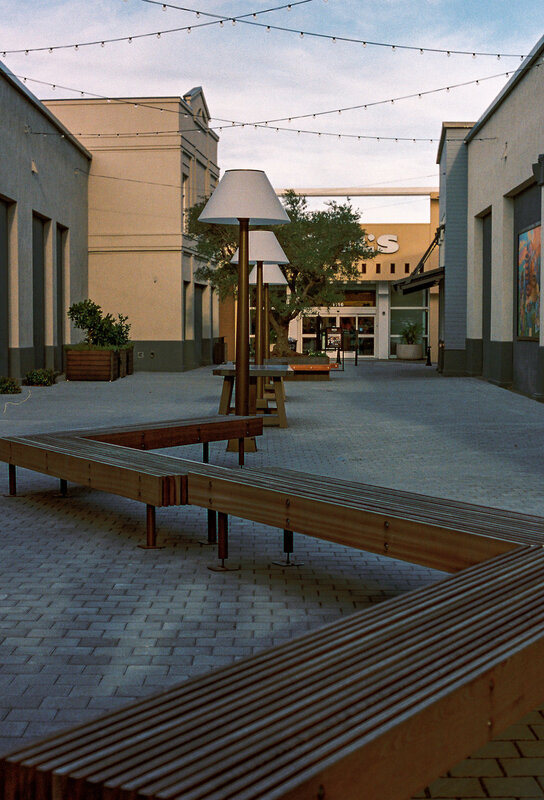 It had been a while since I exercised my little Olympus OM-2n, so I loaded up some Kodak Portra 400 and took a drive up to Yountville, CA for a walk around downtown. The sun was shining and skies were mostly blue when I left Napa. Twenty minutes later, clouds rolled in and I dodged spotty showers all day as I explored the business district. Yountville is a pleasant little Napa Valley town located about 60 miles north of San Fransisco. Around 3,000 people call Yountville home and over a third of the population lives at the Veterans Home of California Yountville, the largest facility of its kind in the US. As I drove by, the grounds and facilities looked impressive and I am going to find out if I can visit and photograph there. The shops along Washington Street provided for some pleasant browsing and at this time of year, there weren’t many tourists. The locals tell me by late Spring and through Summer, the streets are packed. I realized when I got this film back from the lab that I must have been obsessed with signs that day. The town has some great signs! Hunger pains set in on the way home, so I made a pit stop at Oakville Grocery for a hunk of cheese and a bottle of sparkling water. Founded in 1881, Oakville Grocery is California’s oldest continually operating grocery store. The cheese was delicious and the fizzy water hit the spot! I always forget what a joy the Olympus OM-2n camera is to shoot. Its small size and lightweight make it a perfect “walk around all day” camera. It offers everything a 35mm film photographer could want with great metering, manual and aperture-priority exposure modes and top notch Zuiko lenses. I just picked up a nice CLA’d OM-1 and am quite anxious to take it for a drive. The OM-1 is the manual everything OM camera. My OM-2n was CLA’d by John Hermanson. He does fine work and specializes in Olympus. My Portra 400 film was processed and scanned by Ryan Tolbert at Boutique Film Lab. I am working with them exclusively this year as an experiment in getting to know one lab and refining my workflow. My last shots on every roll are mirror selfies. I flipped this one in Lightroom. 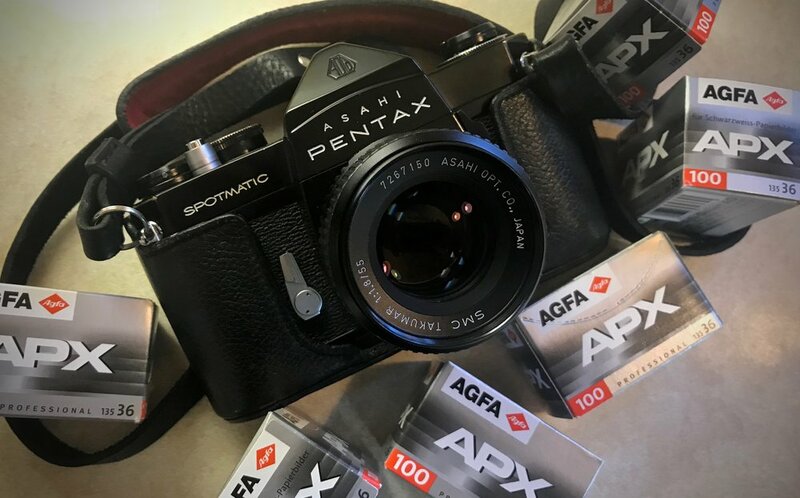 It’s hard to say anything negative about the Pentax Spotmatic F camera, especially after you’ve had yours serviced by master Pentax repair guru Eric Hendrickson. Even with a camera functioning as designed, things can still go wrong. I shot a whole roll of Kodak Portra 400 on the beach in Bodega Bay on New Years Eve 2017. When I went to pick up my film at the lab a week later, the guy behind the counter told me that my roll was one of several that “got stuck” in the machine during processing causing overdevelopment and staining. Apologies, a no charge for the processing and a free roll of film helped ease the disappointment. Even though many of my last day of the year shots were completely ruined, the few that poked through the processing mistake were surprisingly pleasing. Here is one of my favorites. I follow several photography groups on Facebook and besides making the occasional complimentary comment about someone’s gear or a photograph, I rarely engage in conversation. It’s mostly because I have found that even the ones that start out positive tend to make wild swings in the other direction and I just don’t have the truck for that. Recently, however, I did join in on a discussion in which one person asked if anyone knew a good source for a CLA on his Pentax ME Super. Several people, including myself, weighed in with suggestions while another asked why anyone would waste their money servicing an old camera when, in many cases, you can just buy another for far less than the cost of a CLA. The guy had a point. There are ME Super bodies all over eBay for under fifty bucks and a good service from a qualified tech will probably cost nearly twice that. There was a joke told on Saturday Night Live’s Weekend Update some years back about a cat requiring hip replacement surgery. “Cat hip replacement surgery—$5,000. Total cat replacement—$50.” Using the cat analogy, I can certainly see that some photographers would rather toss an old malfunctioning camera and replace it with a new one rather than having it serviced. After many years of buying and using old film cameras, I am squarely in the CLA camp. First, I patiently shop for any old camera I have an interest in. If I am shopping on eBay, I try and look for listings where the seller has taken care with his photos and in writing the item description. I’m also not afraid to ask the seller questions and I pay attention to the response. Kind, courteous and helpful responses signify an honest seller. At least that has been my experience. I also only buy from those with 100% positive feedback. In ten years of buying cameras online, I have only been stung twice and both times it was because I didn’t follow my own rules. These two cameras were the only ones I tossed out and replaced with new ones. When a new to me camera arrives, I do a quick visual inspection and check for any nicks, dents or dings that might not have been apparent in the online photos. I also look for rusty screws which is a sure sign that there may be issues lurking inside. I check the battery compartment for corrosion or battery leakage residue as well as look at the condition of the bottom plate. Next up is the film chamber. I check the film door latch and alignment, inspect the film guide rails, shutter curtain and all of the foam seals. I’ve never met an old camera that didn’t need new seals and many of the issues you see in the Facebook forums are problems relating to light leaks caused by failing light seals. Next up, I check the lens mount for excess wear and take a peek inside the mirror box with a flashlight paying special attention to the mirror bumper foam and other mirror box foams. Many times, a camera won’t focus to infinity because the foam has deteriorated and is causing the mirror to be out of alignment. Gooey foam can also cause the mirror in a single lens reflex camera to stick. So many old camera woes can be cured with a re-foam. After the visual inspection, I insert a battery and try the camera’s battery check feature. This is the first test of an old camera’s circuitry. After mounting a lens, I switch on the meter and check for a needle or LED readout and check to see if the meter reacts to shutter speed or aperture changes. Then, I fire the camera through all of its shutter speeds. If all seems good, I go out and have some fun! Even if an old camera functions as designed, if I enjoy shooting it, I’ll invest in a CLA. I am always amazed at how wonderful these old cameras are when they return from a good service. They sound better, the film advance is smoother, shutter and meter have been calibrated and…they even smell good! My, it’s been raining here in Northern California. And I mean raining. Over where I used to live in Sonoma County, they got almost six inches of rain in one day last week! We get a little sun here and there and when we do, I get out and take pictures. I have five cameras with partially shot rolls of film in each right now, so there’s plenty of Fogdog Blog content coming once Mother Nature strings along more than 12 dry hours for me. I’ve packaged up my Leica R6 so it can get a proper CLA from DAG Camera. I’ve discovered that Garry’s Camera Repair in Illinois will service my Minolta XE-7. I love the XE-7 but it’s got some sort of shutter curtain synch issue and it’ll be good to get it fixed. I love using my Olympus OM-2n, but the 50mm f/1.8 lens that came with it has quite a bit of dust inside and someone carelessly left some cleaning marks on the front element, so I ordered a replacement f/1.4 lens from KEH this week. KEH’s grade on this new lens is “excellent.” I’ve found the KEH grading system is very conservative, so I am sure my new Zuiko lens will be excellent and then some. A good Pentax friend sold me a nice 120mm f/2.8 Super Multi-Coated Takumar lens that I’m anxious to try out on one of my Spotmatics. I played around with it one afternoon and I think it will be a fun lens to use! Speaking of my Spotmatics, I have identified a few duplicate SPII bodies I have. Nice cameras, CLA’d by Eric Hendrickson. If anyone is looking for a sweet Spotmatic, let me know before I eBay them. I’ve taken advantage of some online deals on film, stocking up on some of my favorites; Kodak ColorPlus, Fuji Industrial 100 and 400 speed Tmax. And I’m kicking around ordering a few packs of the latest Polaroid Originals film for my SX-70 and see how that stuff is evolving. The rainy weather will soon pass and I am anxious to get out, finish up my half-started rolls and explore my new home. My goodness, I’ve walked some beach miles. It’s where I’d go to shake off a bad day. Or do some thinking. Sometimes not think of anything at all. Certainly exposed a lot of film there. I need to find a new place now for peace and solitude. Nearly a decade ago, when I took up the photography hobby again for the third time in my life, the landscape had changed considerably. Digital photography had pushed a ton of surplus analog gear onto the used market and cameras that I could only dream about as a young person were suddenly attainable. Working my way through these great cameras has brought me considerable joy and the process of putting hundreds of rolls of film through them has produced an added benefit…I’ve become a more competent photographer. That being said, I can admit now to a foolish thought I had just about every time I won an eBay bid or clicked the BUY IT NOW button. As I carefully researched the new object of my photographic desire, read the online reviews and watched the You Tube videos, there would be this thought that this next camera would be “The One!” A camera so perfectly designed, with just the right features and a feel so wonderful that it would be the Holy Grail of cameras! I’d happily shoot with it and it alone for the rest of my days. I thought I’d found the perfect camera in a Nikon Rangefinder, until I sold it to finance my first Leica M. Careful, Leica cameras are like crack. One leads to another and that one leads to yet another. With all of the hype, you might think that one of the Leica rangefinders might have been “The One” for me. Truth is, Leica cameras are sumptuous, but I’ve discovered that I’m a single reflex guy at heart. Truth is, nearly ten clicks in, I’ve come to the conclusion that there isn’t just one camera that hits every sweet spot for me. Some come darn close and those are the ones that have found permanent homes in my camera closet. I’ve also found that if I put a camera away for months or even a year, pull it out and put a roll of film through it, I’ll sometimes appreciate it things about it I never noticed before. I’ve given up the notion of finding “The One.” I’m enjoying the journey instead. I moved inland into Napa County in late December, so I’ll not be visiting the North Bay beaches as much, but I do intend to get down to Carmel again this year and maybe shoot some along San Francisco’s Great Highway. And once the weather warms up again and it stops raining, I’ll get out and shoot some Napa vineyards and such. 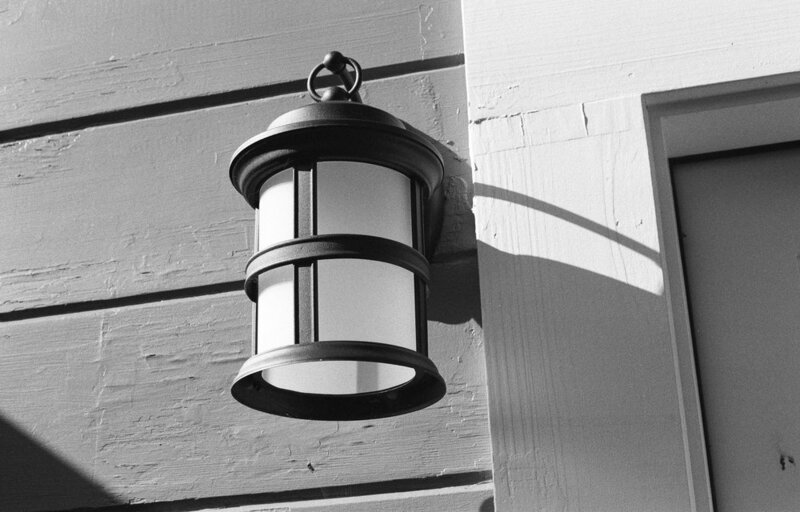 Here are two shots from not long after I moved to Sonoma County, exposed on Kodak’s BW400CN film with my freshly serviced Nikon F2 with DP-1 Photomic finder. BW400CN was a black and white film that could be processed in C-41 chemistry. It was convenient and I was always happy with my results with it. One of the things I had to give up when I moved at the end of last year was the pleasure of taking a long lunch break at work and dropping by the little camera shop near my office to drop my film off for processing and browse the used camera case. 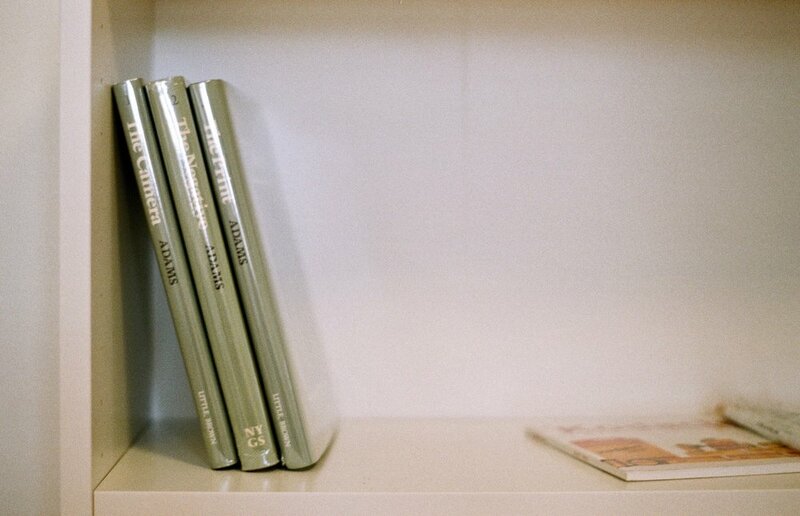 The store does C-41 processing and scans in house and sends B&W and E-6 out to a lab in San Francisco. Their in store mini-lab does really nice work and I always enjoyed chatting it up with the folks at the front counter who are all long time photographers. And more than once, that camera case has separated me from some of my cash. That little camera shop is now more than 40 miles from me and that means a change to my workflow; mail order processing. I’ve used a few mail order labs before and have had good results, but I have always had in the back of mind the thought that it would be a good exercise to find one lab, get to know them and they get to know me. It would be helpful to establish some presets for the various film stocks I used regularly, eliminate at least a few of the variables and heck...maybe even develop my own personal style. Sometimes, life has a way of delivering what you wish for and as I was packing boxes and working through the various aspects of my move, I got an email through the blog from a film lab in Tennessee asking if I would be interested in giving them a try. Sounded like perfect timing! And while the business has grown dramatically, Ryan is committed to treating every customer relationship as a personal one and process each roll as if it was his own. He’s accessible and loves communicating with his customers. This is a guy who loves film! In a way, Boutique is really a snapshot of where the film industry is headed. Hobbyists and passionate people who are devoted to analog photography are keeping film alive. And with big commercial labs closing, small custom labs like Ryan’s are going to be holding up the industry. And that’s good for all of us. Here are some shots Ryan sent me of his lab. Clicking any of the images makes them larger. Working with Boutique is easy. Fill out a clean, simple form on the website. There are processing and scanning options and Ryan’s prices are very competitive considering the personalized service you are getting from him. His website lists 5 business days processing time on C-41 and 7 for black and white or E-6. I sent him two rolls of C-41 and two black and white and had all my images back via an Amazon S3 download in 5 days. I received two nice emails during the processing letting me know the status of my orders. I purposely didn't provide any special instructions when I mailed my film in, just to see what I’d get back. I liked the fact that my image folders were titled with the kind of film I had sent in. My photographs were of nothing special, but the scans I got back were very, very nice. Processing was spot on and the scans were some of the best I’ve had from any lab. 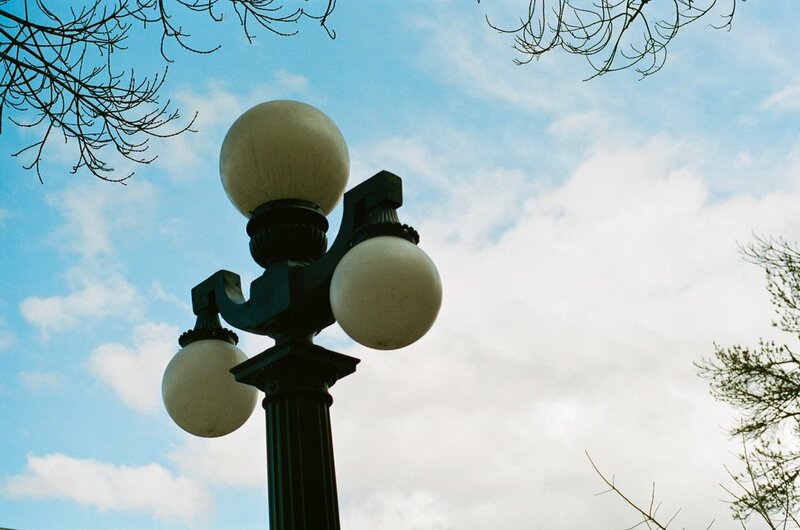 I posted a few of these on January 30th, shot with my Leica R6 in my review of Fuji Industrial 100 film. I’ve always wanted to build a relationship with a lab and I am so encouraged by this first interaction with Boutique Film Lab that I’m going to make a commitment to use them for the bulk of my color (great that they can do E-6!) and most of my black and white photography this year. You can find Boutique Film Lab here. I say “most of my black and white photography” because one of the nice things I’ve just discovered about my new location is that there is a very cool rental darkroom about 10 minutes away from me. I’m taking the tour this weekend. I’m excited about having access to an enlarger and for the first time in many years…printing some of my black and white negatives! 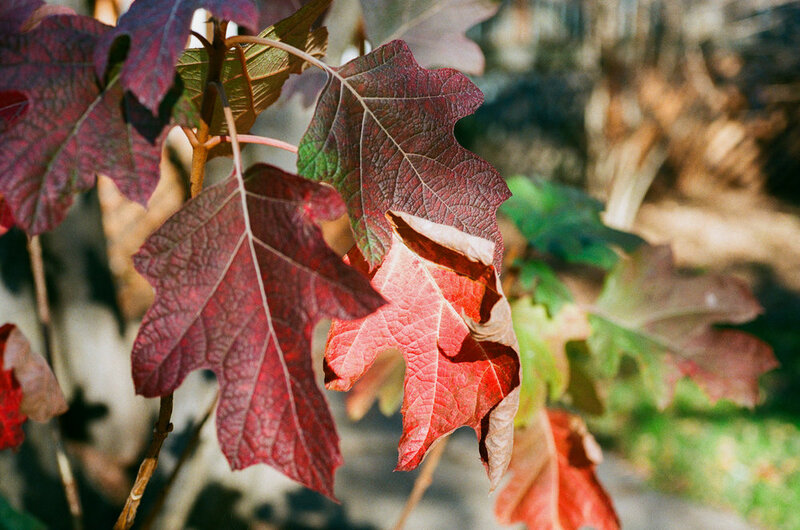 I follow a few photographers on Flickr who are doing some nice work with a very basic color film from Fuji called Industrial 100. This is a film intended for the domestic market in Japan I think and I am sure it is less expensive over there than it is here in the US, but at around six bucks a roll for 36 exposures, it’s a value. I kind of like the minimalist packaging too. I’m finally getting settled into my new life, allowing me a little time on a recent Sunday afternoon to try some of this film in my Leica R6 around my backyard. I used the 60mm f/2.8 Macro-Elmarit-R lens and exposed the film at its box speed. The meter in my R6 flirts constantly with overexposure, so I have to pay attention. I love using the R6 so much that I’ve put it in the queue to go to Don Goldberg for a proper CLA very soon. I am a fan of 100 speed films—Acros 100, APX 100, Plus-X. If Ektar wasn’t so saturated, I’d love it too. This Fujicolor 100 film hits the sweet spot for me. I liked the results it delivered on this first day of shooting in the New Year. I bought a half dozen rolls, so there’s more to come. PS: I’ve discovered a brand new lab for processing and scans. They did this roll for me along with some Kodak Portra and P3200. I’ll be sharing my experience with them soon and what I have decided to do about processing and scanning in 2019. Stay tuned. Feeling a bit more settled now and finished off some Portra 400 in the Nikon F3, Fuji Industrial in the Leica R6 and two rolls of P3200 in the Minolta XD. Ahhh. Giving a brand new lab a try too! There’s been no familiar point of reference for me these past five weeks. New town. New home. New job. New commute. I’ve had to find a new place to do my grocery shopping and tomorrow, a brand new stylist will cut my hair. It’s been unnerving. I love familiar and there’s been absolutely nothing about this that’s familiar. I have had my share of anxiety and restless nights. So I’ve made myself feel better, calmed myself down a bit by setting up a space in my new home for my camera gear. It’s modest, minimalist and won’t always look this tidy. My desk. I use the red felt pad to work on my cameras. 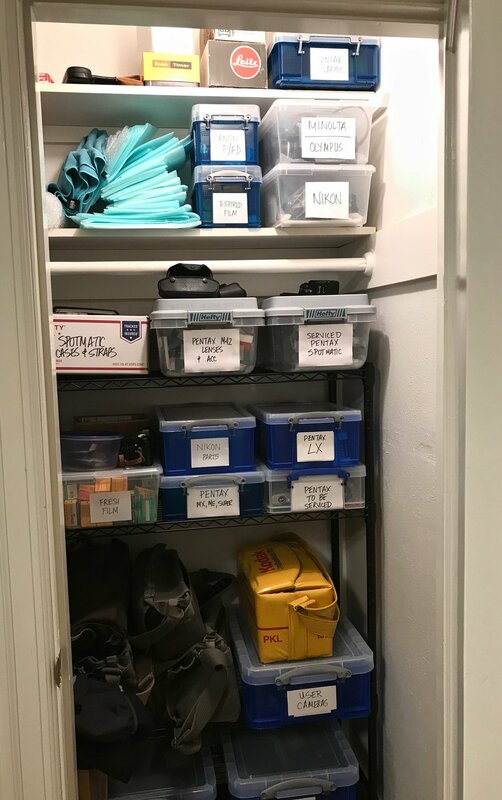 In my new house, I have a large closet to organize my gear and keep it all out of sight. It’s been hard for me to find touch points during this transition that have brought me peace of mind, but I discovered that the process of unpacking and organizing my cameras brought about a nice, calm feeling of familiarity. Just handling my gear made me happy. Photography has always been the one constant in my life, from my awkward teenage years, through a troubled marriage and divorce, moves and career changes, I’ve always had a camera or two. It’s been good and lately, it’s been necessary. I don’t use the camera in my iPhone for much other than taking photos of the analog photography gear I write about in this blog or sell on eBay. Don’t get me wrong, the Apple phone has a fine camera and it’s damn convenient, but I just don’t enjoy the phone photo taking process beyond its utilitarian value. Photography for me is so tactile. Dials, levers and gears. An analog light meter needle swinging up and down in the viewfinder. The wonderful sound of a mechanical shutter. On Friday night however, I’m glad I had my iPhone handy as the sun slipped below the horizon on the shortest day of the year. Mother Nature served up a spectacular sunset for me. 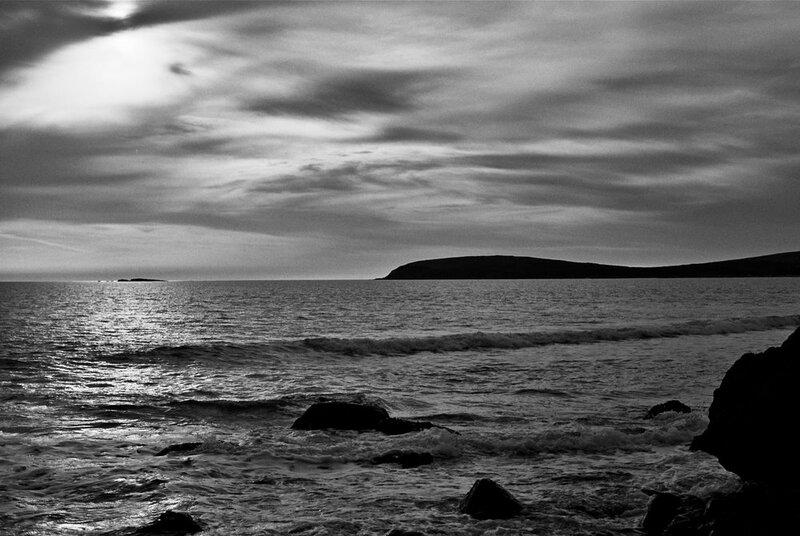 I took a deep breath and held back the tears as the Pacific slowly swallowed up the sun. My last Winter Solstice on the Sonoma Coast.